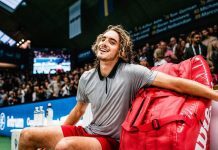 In the semis, the pressure of the moment and three disastrous double-faults undermined Auger-Aliassime, as he was subdued by Isner’s tiebreak power. Shapavolov confided that he’d been waiting his whole life to play his idol. He was promptly schooled by Roger, who does relish playing the role of the master. Then again, does any other sportsman amaze us like Roger? He brings a bounty of gifts: athleticism, technique, grace, variety, footwork, fight, flexibility, attitude, decision-making and longevity. “Time waits for no one – except Roger,” said Chris Fowler. Simply put, Roger keeps astounding us. Just four weeks earlier he’d grabbed headlines when he won his 100th career title. Another Federerian love-in subsumed sports. Then he reached the finals of Indian Wells. 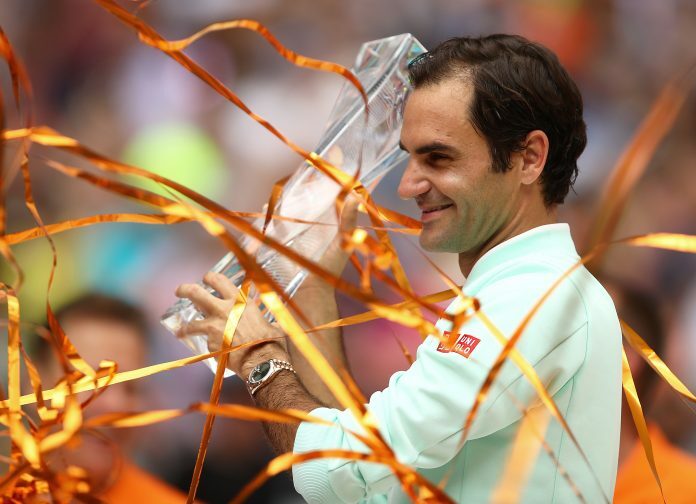 Still, faultfinders whispered, Roger hasn’t won a Slam in well over a year – or a Masters since 2017. And, goodness, he’s lost 22 Masters finals and four of his last five. But in a Miami football stadium, Federer scored one touchdown after another. In the home of the Dolphins (the only animal that gives us a perpetual smile) the most joyous tennis player of all time beamed throughout a dreamy run to his fourth Miami title and his 101st tourney triumph. His greatest threat came in his opening match against No. 46 Radu Albot when he dropped the first set. Then Roger righted his considerable ship. In the quarters he faced Kevin Anderson, who in a Wimbledon marathon last summer handed him a shocking defeat. In Miami, Roger crushed the big hitter 6-0, 6-4. Then he dismissed his wide-eyed fan Shapovalov, 6-2, 6-4. In the final Roger faced Isner. The defending champ hadn’t lost a set and had beaten Federer the last time they’d played. Roger did lose the first point on his serve. But Federer’s mind-boggling return of serve blunts the firestorms of the mighty. He’s 41-6 against the five biggest servers of our era – Roddick, Karlovic, Raonic, Anderson and Isner. Yes, the 37-year-old has a receding hairline. We see the furrows on his face. Still, he meets one challenge after another with a seamless ease that inspires. And, by the way, as this man navigates the currents of his fierce sport he always seems to have a smile on his face – just like a dolphin. Miami’s women’s champ, Ashleigh Barty, is different. She’s from a distant island and is the first ever Aussie woman to win in Miami. She’s Aboriginal, is 5’ 5” and plays in the tradition of shorter savants – Rosie Casals, Arantxa Sanchez-Vicario and Justine Henin. Plus she’s an all-court player, like her fellow Aussie, Margaret Court. She doesn’t have a huge serve – her groundies are modest. But her grit and intent are massive – her slices are nasty. For years she couldn’t improve on her triple-digit ranking. She was considered a doubles specialist. She stopped playing for a year and a half and played pro cricket. The absence did her good – and she’s been in the top 20 since 2017. Still, she’s struggled in big tourneys. But, for the appealing 22-year-old, this year has been a Barty party. She reached the Aussie Open quarters, led Australia to a Fed Cup win in North Carolina, and used her mix of finesse, guile and power to take it to a listless Karolina Pliskova in Miami. She absorbed the Czech’s power, used her inventive slices as weapons and hit an amazing 15 aces to score a convincing 7-6 (1), 6-3 win. In Hard Rock Stadium, Barty was the light of the party.